Something remarkable happened last year around the time of my 34th birthday and the winter solstice moon that followed. I received a revelation and felt called to build. It was clear that I wasn't supposed to build my own table; rather, I had to build a whole house! If you have taken some time to click around, then you will notice that all of my work from my first blog "Mommy in Milwaukee (MIM)" is now available, and my academic work from my second site, too. I merged both of my previous sites into one. It was during the time in December that I immediately knew I would make the content from my deactivated MIM blog available again, especially for folks who found my posts useful. Although I have grown in many areas as a result of my own conscious awakening, it was important for me to look back at how far I have come. Even with all of these transformational shifts, I had a foundation that I knew I could build on. I had a very clear vision of what to work on in the new year, but for a brief moment, I allowed myself to feel doubt. I thought about all of the waves of folks that have followed my online journey--those of you who have been with me since the beginning of my blogging career in 2013, those that joined me in between one of my--what I'll call--"social justice advocacy periods," and a final wave that found my online space toward the end of last year, when I joined another Instagram challenge (#10x10RepresentationMatters) centered on representation and inclusion in the ethical fashion community. These were all pertinent things that I wanted to discuss and be a part of. But I never did fit neatly into any of these categories. What I realized, as these clear categories appeared, was that I was allowing myself to be defined by others' ideas of me because I thought I had to fit into a category. There are also degrees of judgment further nuanced by all of the different aspects of my identity. I am a first-generation Puerto Rican migrant born in Ohio, from a large religious family who struggled as new migrants to this country. I grew up speaking Spanish in a mostly African American and Latinx community until we moved when I was in 5th grade. My parents are Black and Brown Puerto Rican people. In some spaces, I was the one with the most melanin. In others, folks couldn't put me into a category. 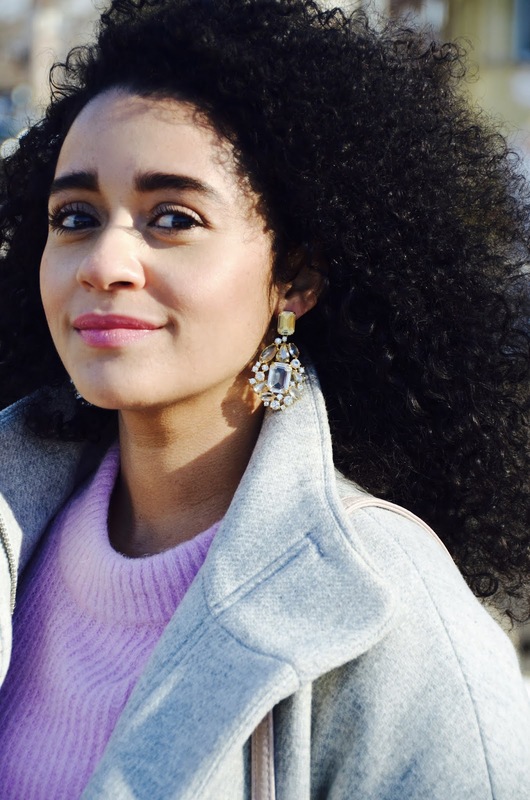 I still remember the way that many Latinx women looked at me (and still do) in shock when I began to speak Spanish, their response would be, "Oh, I thought you were 'mixed or American' (Read: Black and White), which is a common way for Latinx communities to erase the very significant African heritage that many of us share. It would take years for me to realize that I do not have to choose one. I was also worried at how others would react to me changing my mind. Yet, change isn't necessarily a bad thing. Change, when coupled with awareness, can birth a new level of evolution within ourselves that forces us to bloom. I worried that if I shared who I truly was--all of me--I'd be deemed "too much" or "not enough". These thoughts shaped the areas and ideas that I chose to share in my online space. What my arduous inner work has taught me is that there is always a root to my worries. Until I remove the root of my planted insecurities, they'll find a way to regrow. I spent last summer with my mentors and therapist--immersed in nature and deep within myself--to sort through my root causes. It was through that process that I began to break through and allow myself to feel my pain. In October, I dropped out of the graduate program that I believed would fulfill me, after having stayed home with my three and creating my 'Mommy in Milwaukee' blog. After I dropped out, I began sharing all of my academic work online on my second site. Since all of my research was about identity and marginalized communities, I wanted the very folks I was writing and researching about to have access to my work for free, which is a problem that happens time and time again within academia and Social Justice. I am no longer afraid to take up space with my whole self, and it's taken years of work to embrace that my existence is resistance, and sharing my joy is a huge part of that too. I can look back now and see how this process was life-changing and transformative. Yet, although I experienced periods of deep conscious awakening, I also had moments where I couldn't see my next steps. It felt like total darkness. At the same time, I learned to trust my intuition that I ignored for so long. I may have not been able to see it, but I felt it in my soul. What I understood, as my vision for the new year began to unfold, was that this period of darkness provided the most healing for me because I was finally willing to dive deep into my shadow that I refused to travel into for so long. I did not stop. . . even when I felt like everything that I thought "gave me value" began to fall apart. I have arrived at a place where I can freely share my truth and joy, which is my birthright. Madrehood: Here, you'll find all of my birth stories, pregnancy, postpartum, and other posts sharing insight of what has worked for me as a mother of three children while I blogged at my MIM website. I was always open with my motherhood experience. But there was a lot I never discussed, including many personal stories about race that impacted my parenting in a significant way. I can look back now and acknowledge that I was not ready to share. There were internal wounds that needed to heal. Moving forward, I now share my experience to center my voice as a brown mother. What I am creating now is alchemy, which takes a lot of dedicated time and work, but I am thrilled to continue. I am now finishing off my first article in a parenting series of my perspectives as a brown mother raising conscious white-presenting kids, and I am excited to share it with you all. 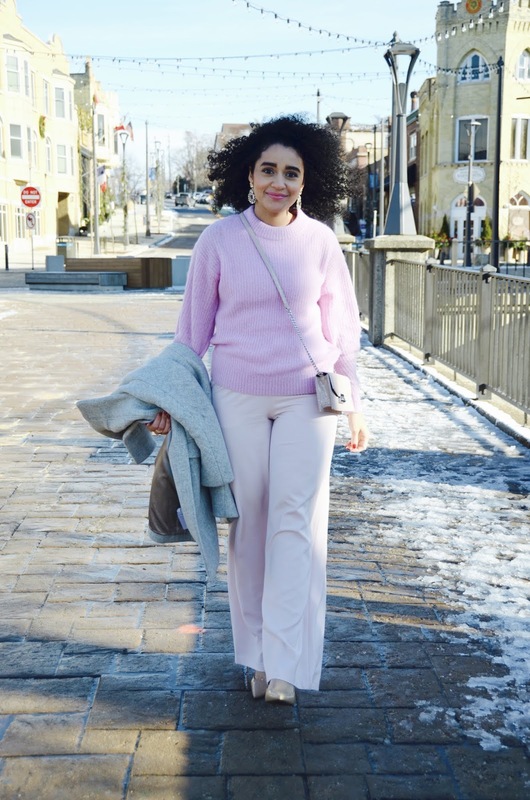 Style: You'll find all of my maternity and non-maternity outfit posts, curly hair care and anything pertaining to skincare and makeup under this tab. I have always loved clothes and fashion. But, as time went on, I did not want to approach shopping in the same way. Towards the end of MIM, I decided to launch a sustainability project that was focused on less consumption and waste, but I did not go far with that. I did move forward with it offline and began to release items that no longer served me. I wanted only items that sparked joy. BTW, I haven't watched Marie Kondo's Netflix series yet (we don't have Netflix), or read her book, but I got the gist of it though and after moving out of our apartment, it became the perfect time to assess our consumption and organize. It was also around that time that I became conscious about not purchasing fast fashion, which is at the center of human and environmental exploitation. Fashion must be inclusive, sustainable and ethical, if it's going to work. I do not get it right every time either. In fact, I often find loopholes in my process, but I want to do better. I have made a commitment this year to buy only from ethically-made brands, brands making changes to do better, ethically-made brands owned by Black Indigenous People of Color (BIPOC), and previously owned clothes. If I share an item that does not fit into this category, it's because I have owned it for quite some time or purchased it last year. I might also share an item, because I appreciate the quality and longevity of the piece. I want to share versatile garments that can be styled in different ways, and I plan to share that in this space too. 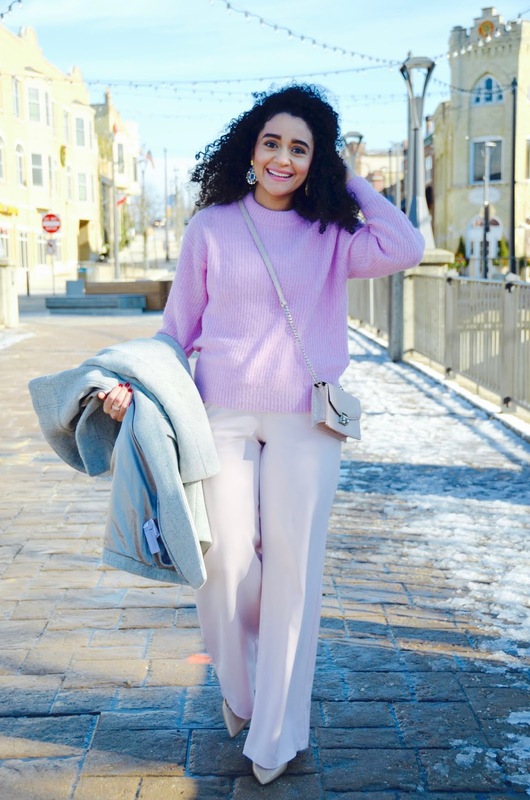 I used to work around what a brand offered me to style, or what I thought was a good deal or cute, without taking any of the aforementioned factors into account. That is no longer my priority moving forward and I am excited to share more of my process with you all! For transparency and legal purposes, I will always write if an item is gifted to me and whether or not a post is sponsored. Living: In this section, you'll find all of my home decor, family stories, medical (physician) family journey (my partner is in his last year of anesthesia residency wepaaa! ), recipes, and how we are transitioning into a more sustainable lifestyle. I will also be expanding this section to include my own spirituality, which goes hand-in-hand with conscious living for me. Making wherever we have lived a home has always been my joy, and that is what I will continue to share here. I am a kitchen witch. Ultimately, we want to grow our own food and compost our waste. But it takes steps to get to that point, and we want to be open in sharing our process with you. As I mentioned above, when we moved into our new place, I immediately began to release what did not serve us. This house is about 500 sq feet larger than our previous apartment and over 80 years old, which brings its own set of challenges. I don't know if we qualify as "minimalist" but we strive to live with only the things that we need, and that can be a struggle in our consumerist world that performs at the expense of so many marginalized communities. Even more so in the medical profession where success is mostly measured by extravagance and excess. Then again, I could argue that this happens in most U.S. professions. It has been a long eight years of training. The process is absurd, expensive and has pushed us to the brink of exhaustion most months. Four of those years were medical school, and we are now in the 4th year of residency, which varies depending on specialty. Then B finally finishes in June. Then we have another year of fellowship, and it will finally be time to spread our wings and fly to some place where we can grow roots. It is still a lot to process for me, because it will be a new territory in all aspects for our family. Are we still learning? Absolutely. Do I have all the answers? No. However, I embrace the process that works for us. Academic Work: This section contains all my research on intersectionality, Puerto Rican history, identity and I will be releasing all of my research that would have made the bulk of my graduate thesis. Shop: You'll find direct links here to most of the items that I share or similar ethically-conscious brands. The point of me sharing the items isn't so that y'all can buy things you don't need. You will have to make the right decision that suits your needs and your budget. Clothing and money are such personal topics and also a huge part of our identity. However, I think that if we speak openly about our shopping process, then we allow a discussion to flow and create better habits that will benefit more people and our environment in the long run. That is my hope! I've wanted an alpaca sweater for quite some time now, and when I found it in this color, I knew it was the one. This is my first Everlane purchase, and I am very happy with my experience so far. It is a very lightweight sweater and although the color is called "cool pink" it has more of a lilac undertone. Also, keep in mind that it is slightly see-through. At the moment, I am obsessed with monochrome looks and this time paired it with this old jumpsuit I already owned. 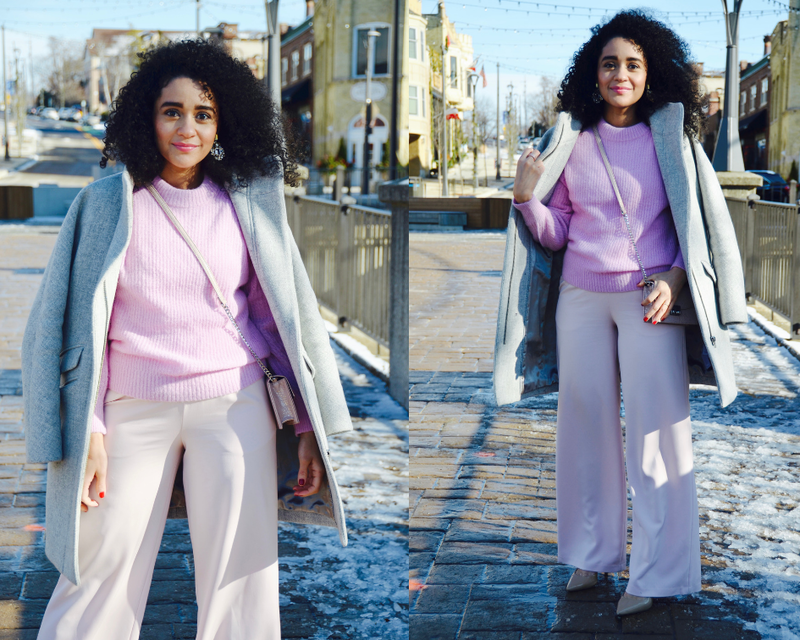 If you own a jumpsuit and want to change it up, try wearing a knitted sweater or blazer over it! My coat is two years old, and I recently visited JCrew and the manager told me that it continues to be released because it is such a classic style. I've read articles about how Jcrew seems to be "greenwashing" how their clothes are made. However, I do appreciate the inclusive aspects of their brand and the sustainable material they use in some of their items like modal cotton and Tencil fabrics for jeans. The quality of most of their items receive high marks from me, too. Also, in their sibling store, Madewell, any brand of jeans can be recycled for a $20 off coupon. Most brands respond to their bottom line and, if we demand more items that are sustainably made, perhaps they will get the point that they can do better. 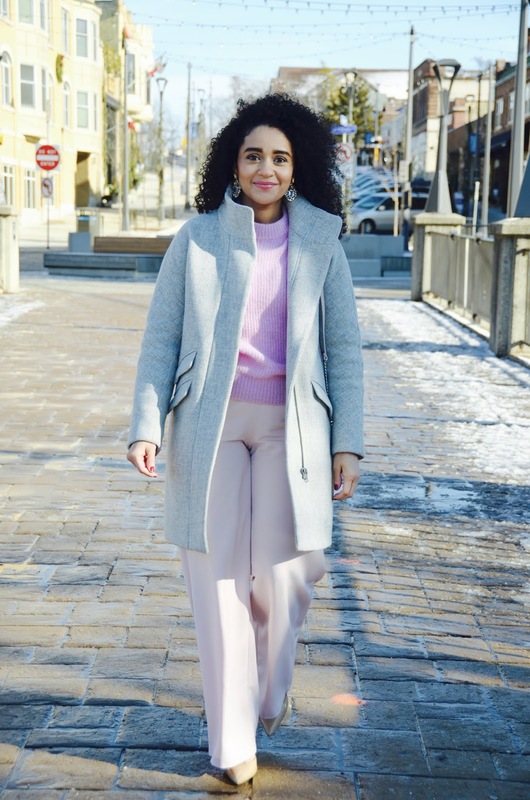 I think that a well-made wool coat is an item that can go a long way in anyone's closet, especially if you live in a really cold weather climate like us. I'll be sharing more ways I've styled this sweater in future posts. These heels are also one of those items I've owned for years, and the makers keep releasing the same style. If the items that you already own are fast fashion items, taking good care of them will make them last. I often use a magic eraser to remove stains off my shoes, and it works like a charm! Also, knowing where your local cobbler is located goes a long way. Instead of buying a new item, consider repairing it. 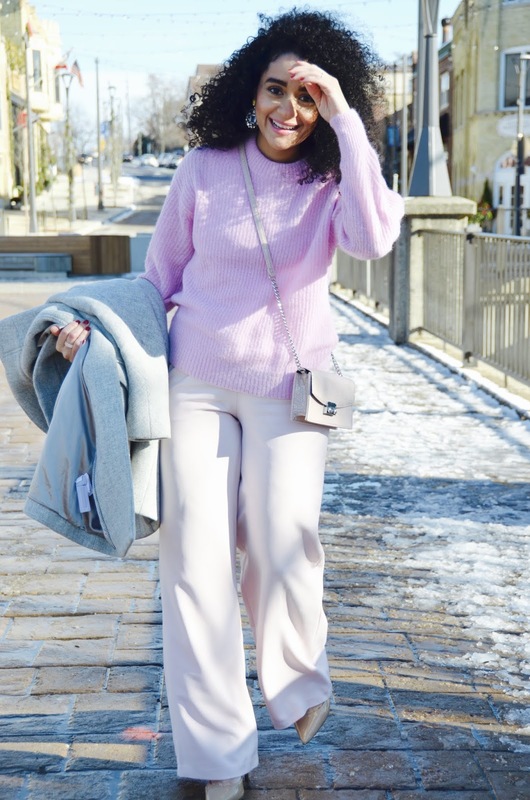 I have a pair of winter white wide-leg trousers that were my faves but recently got destroyed in the dryer that I will be hemming and making into a pair of culottes for summer. I also finally purchased this pair of statement sparkly earrings, and I am in love. 😍 They go with whatever you want them to go with. I plan to wear sparkles whenever I need a little pep in my step. Thank you for taking the time to read and join me in my new space. I appreciate all of you! Please say hello in the comments, I have always loved connecting with my readers. My intention is to share three posts a week, and I am so excited for what 2019 has in store for all of us. Sending you all so much love, and Happy New Year! Thank you so so much, amiga!! Right back at you, XO! !